Walnut Brownies… and a new beginning. As a child, I have been absolutely averse to anything sweet in my food. Yes, absolutely anything sweet with the only exception of sugar in my tea. People often wondered how I never craved for chocolate and I often wondered what was there to like it in the first place? My mom used to make Indian desserts which everyone in the family relished. I never understood how and why. 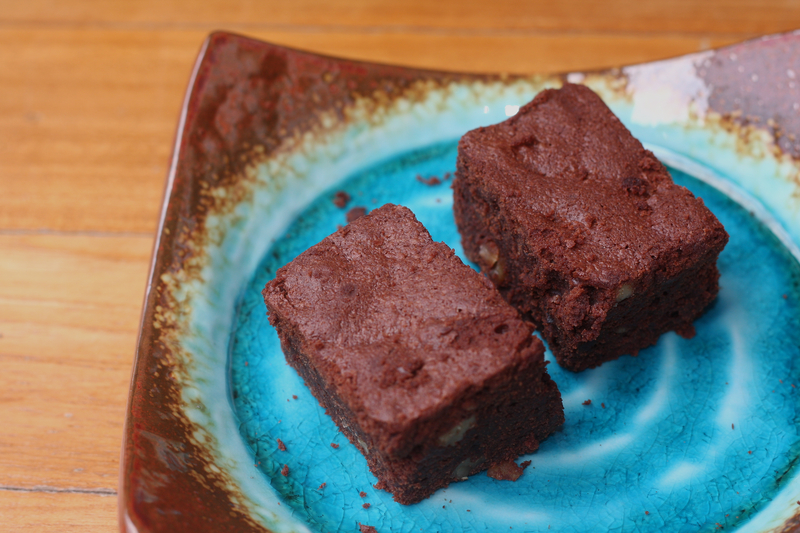 So, here is my favourite dessert of all – walnut brownies. This is Nigella Lawson’s Walnut Brownie recipe from her book “The Domestic Goddess”. I made half the size and therefore halved the ingredients and used a smaller baking dish. For a printer-friendly recipe, click here. Original baking dish size recommended: pan measuring 13x9x2.5 inches. As I made 1/2 the size, I used a smaller baking dish. Preheat oven to 190°C. Line the sides and the base of the baking pan (preferably square) with aluminum foil. Melt butter + chocolate together. Use a heavy bottomed pan and extremely low heat to melt this mixture. I used a plate with the above mixture and let the steam melt this mix. Let it cool down slightly before you mix it. Measure flour into a separate bowl and add the salt in it. Keep aside. Beat eggs, vanilla and sugar together. Whether you are using an electric mixer or doing it by hand, remember to beat it in one direction only. If you are doing this by hand, it will take about 15 mins to get the right consistency. Do not over beat until the mixture becomes fluffy. The idea is to beat everything well and combine it together. After beating it well, you will notice that the color of the mixture will change. Once you are satisfied that the above mixture is well beaten, add the slightly cooled chocolate & butter mixture into the mixing bowl where you’ve already beaten the egg, vanilla and sugar. Combine it together. After mixing the above, add the walnut and the flour. Add the flour slowly bit by bit, mixing it together. It helps to use a sieve for this purpose as it controls the amount of flour going in and gives you enough time to combine the ingredients together and avoid forming any lumps. The purpose is to bind it together into a smooth mixture – not over-beat it. Transfer the above mixture into the baking dish prepared. Bake for 25 mins. When it’s ready, the top should be dry and the inside dense & gooey. Once done, remove from the oven immediately; let it cool naturally. Don’t leave it inside the oven once it is done. I have done that once and my brownies were a little dry from inside… Remember it cooks even during the cooling process.